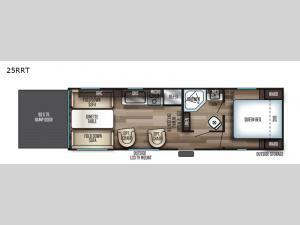 Take this Cherokee Grey Wolf toy hauler out to the campground of your choice for loads of outdoor fun! Create delicious dinners with the fabulous features found in the kitchen, like the three-burner range top, microwave, and residential farm-style stainless steel sink. For a comfortable night of rest, head to the front master suite where you will find a queen-size bed, dual wardrobes, and a TV mount. You will even be able to host any neighbors that drop by with the fold-down sofas and dinette table.